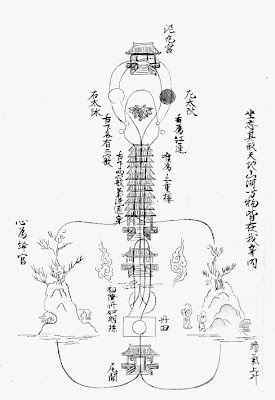 The Japanese alchemical chart of the body reproduced above is entitled Shūshin kyūten tandō zu 修真九轉丹道圖, or Chart of the Way of the Elixir in Nine Cycles for the Cultivation of Reality (the Chinese reading of the title is Xiuzhen jiuzhuan dandao tu). Although no precisely corresponding picture seems to be found in Chinese texts, it is likely that this chart is either copied from, or based on, an earlier Chinese exemplar that may now be lost. From top to bottom along the vertical axis, the Chart shows: the upper Cinnabar Field; the eyes; the tongue; the trachea; the middle Cinnabar Field; the lower Cinnabar Field; and the Caudal Funnel. 1. “Palace of the Muddy Pellet” (niwan gong). The upper Cinnabar Field, commonly called Muddy Pellet. 2. “On the left the Great Yang”. This and the next captions refer to the eyes. The left eye represents Great Yang. 3. “On the right the Great Yin”. The right eye represents Great Yin. 4. “The tongue is the Red Lotus” (honglian). 5. “Under the tongue, on each [side], there are two openings”. These openings are the Cinnabar Cavities (danxue), which should be kept closed by the tongue so that the True Breath (zhenqi) does not escape. 6. “The throat is the Twelve-Storied Pavilion” (shi’er lou). This is a common name of the trachea in Neidan and meditation texts. 7. “Through two [of the four] openings, Breath (qi) flows and pervades the body”. 8. “The heart is the Crimson Palace” (jianggong). The middle Cinnabar Field, commonly called Crimson Palace, is shown at the center of the picture. 9. “Cinnabar Field” (dantian). The lower Cinnabar Field is the dantian proper. 10. “At its first descent, the Elixir is similar to a Luminous Pearl.” This sentence refers to the first stage in the formation of the Elixir, i.e., the first of the nine cycles mentioned in the title of the Chart. 12. “As I sit and forget my form (xing), all the mountains, the rivers, and the ten thousand things are within my body”. The word used here for “body” is shen 身, which denotes not only the physical body, but the whole person. 13. “The Breath (qi) of the gallbladder rises above”. The Precious Pearl in Chen Nan’s first verse is equivalent to the Luminous Pearl of the Chart (no. 10 above). The second verse is matched by one of the captions in the Chart (no. 12). The term Red Lotus in the third verse is found in the Chart (no. 4), which also mentions the two pairs of “openings”, i.e., the Cinnabar Cavities (no. 5). The expression “flow and pervade” in the fourth verse is used in the Chart (no. 7). The True Water [generated] by [number] 1 of Heaven is stored in the gallbladder. When Yin and Yang conjoin, they descend [into the lower Cinnabar Field] and form the Elixir. At its first descent, its shape is similar to a Luminous Pearl made of one drop of dew. Besides including the term Luminous Pearl, one of captions in the Chart (no. 10) consists of sentence that alludes to the final part of this passage. Finally, another caption in the Chart (no. 13) mentions the gallbladder. 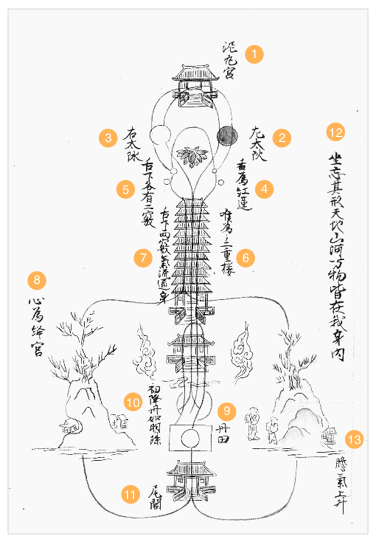 Considering these multiple analogies, it is significant that the Cuixu pian is concerned with a Neidan process in nine cycles, which are also mentioned in the title of the Japanese Chart of the Way of the Elixir in Nine Cycles for the Cultivation of Reality. As for the words Cultivation of Reality, they may be a direct reference to the above-mentioned work that now contains the Cuixu pian.